Custom eco-friendly spiral jotter and pen is a very popular gift handed out during promotional events such as road shows, tradeshows or it is also preferred as a acknowledgement token. Marketers who are trying to build bridges with existing customer base or trying to convince new set of customers can rest their hopes on this jotter and pen. It makes a great gifting choice for anyone who is serious about addressing their customers and loved ones. Large discounts can be availed on bulk orders. Request for a quote to know more. 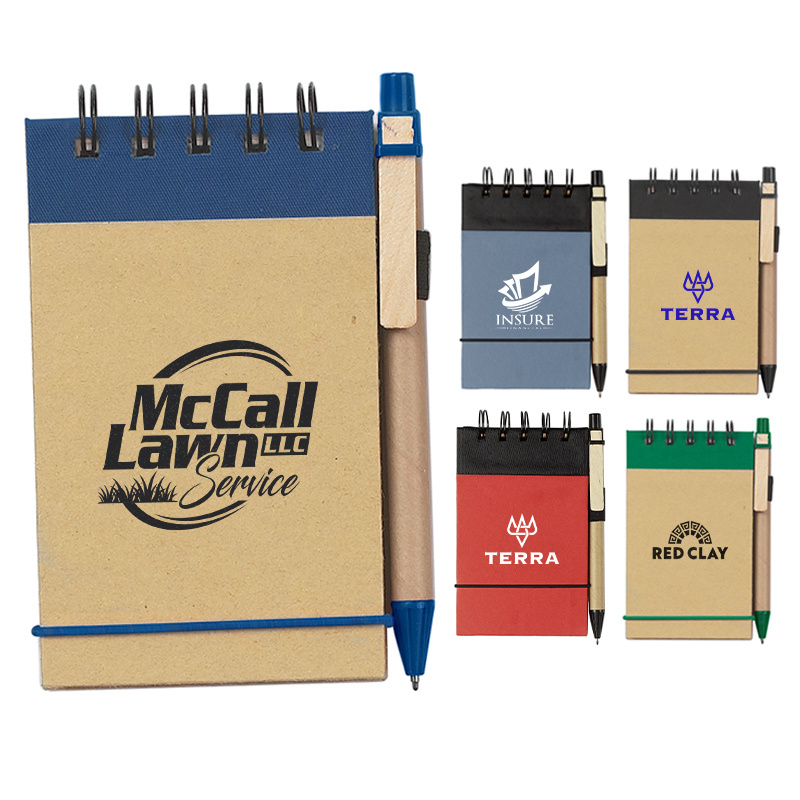 Features – 65 lined pages with recycled jotter, elastic pen loop, elastic band closure, and pen has recycled paper barrel with wooden clip. Colors available – Lime Green, Blue, Light Blue, Charcoal, Red or Orange, all with Black Trim. Pens have Natural Paper Barrel with Black Trim. Natural with Green, Blue, Black, Red or Orange Trim. Pens have Natural Paper Barrel with Matching Color Trim. Imprint Area - Jotter: 2 ¼" W x 2 ¼" H • Optional on Pen: 1 ½" W x ¼" H - Add .25(G) per piece. Available Colors: Lime Green, Blue, Light Blue, Charcoal, Red or Orange, all with Black Trim. Pens have Natural Paper Barrel with Black Trim. Natural with Green, Blue, Black, Red or Orange Trim. Pens have Natural Paper Barrel with Matching Color Trim.